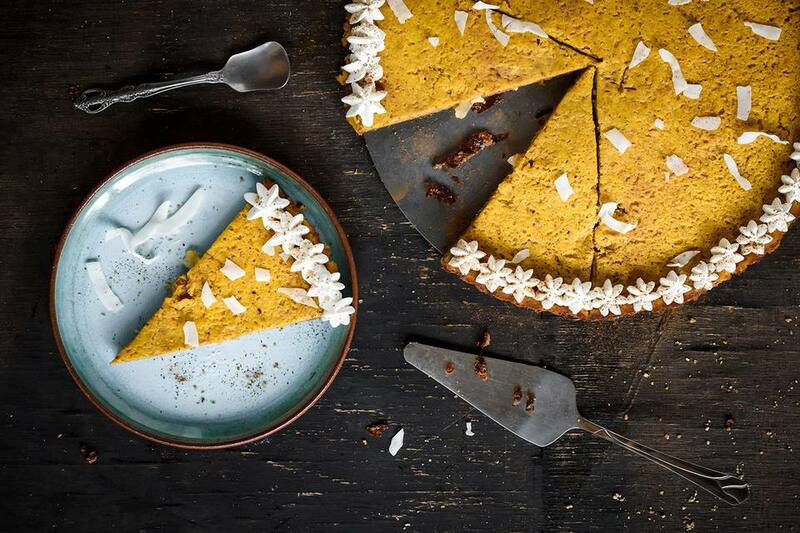 This take on the classic pumpkin pie is a rich, dairy-free (and easily gluten-free) dessert that is perfect for fall and winter holidays. Coconut oil makes the crust melt in your mouth, and coconut milk in the filling creates such a decadent flavor and texture that everyone will ask you for your recipe, while not expecting it to be dairy-free! Trust me: you'll want to try this one! As with any recipe that is intended for persons with allergies, make sure to read all of your ingredient labels thoroughly to ensure that there are no dairy-derived ingredients in any of your products. Note: while there are multiple steps to this recipe, this dairy-free pumpkin pie dessert is broken down into workable categories to help you better plan for baking. Preheat the oven to 350 F. Lightly grease a 9-inch pie plate and set aside. In a small mixing bowl, combine the graham cracker crumbs, coconut flakes, and sugar until well mixed. Press into the prepared pie plate and place in the oven for 4 minutes. Transfer to a wire cooling rack to cool while preparing the filling. In a medium-sized mixing bowl, use an electric hand mixer to beat together the pumpkin, brown sugar, eggs, cinnamon, ginger, cloves, and salt until very well combined. Gradually add the coconut milk until all has been added. Bake for 15 minutes, then turn down the heat to 350 F to bake for 35 to 40 minutes longer. If the edges of the crust start to brown too quickly, loosely tent the crust with foil. Transfer the pie to a cooling rack to cool completely, then chill for 1 to 2 hours before serving. Serve with vegan coconut milk whipped cream if desired. If you do not have coconut oil, or it is unavailable to you, you can replace this with a dairy-free margarine of your choice. If you are able to find coconut oil, however, we urge you to do so; it really adds a wonderful flavor and melt-in-your-mouth quality to the crust! If gluten-free, use gluten-free graham cracker crumbs.